Thanks to anticant for this ink to a Telegraph article. 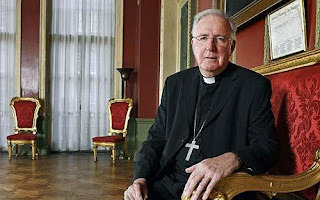 Britain's most senior Catholic leader says that [Britain has an] "unfriendly climate for people of all faiths"
He says that like it's a bad thing! Not sure how it is in the UK, but in the USA the "fight for values" often means government legislation. That's what gets our "liberal hostility" all up in a dander. "the cardinal argues that moves to silence the faith communities must be resisted. "There is a current dislike of absolutes in any area of human activity, including morality," he says. " Actually, I quite like absolutes. And (for example) the Catholic church's teaching on contraception is absolutely wrong. So wrong that they can't even convince the laity of it any more. Where is there this persistent attempt to paint me as a relativist? This rancid rant really takes the biscuit. It is total "through the looking glass" thinking. Ever since it lost its moral and temporal supremacy at the Reformation, the Catholic Church has been consistently hostile to the liberal, civilised values of the Enlightenment, to modernity, and to scientific progress. Yet Catholics take full advantage of the social and technological benefits which this hated "liberalism" has provided. In this day and age they are parasitic throwbacks, seeking to drag us all back to a pre-rational age. Read "Double Cross: the Code of the Catholic Church" by David Ranan for a full exposure of their humbugging 'absolute values' and for the cruelty they all too often practise as opposed to the 'sweetness and light' which they preach. The good cardinal speaks as though the political machinations of Catholicism haven't been a historical source of bloodshed and general ill-will in English history.